Dragon Con is a multi-genre, pop-culture and cosplay festival that takes place annually, in Atlanta, over the long Labor Day weekend. I fondly refer to it as a “nerd’s Mardi Gras” which has become a must go destination for thousands of fans enjoying a weekend filled with everything we love from Star Wars to Fortnite. It started out as a small, local event in Atlanta, Georgia. As the years went on and fandom groups grew; the convention only grew. Now it’s one of the biggest conventions in the country. The only thing bigger than Dragon Con is Comic-Con which typically has above 100,000 attendees. Dragon Con isn’t that far behind in attendance though, with over 83,000-84,000 attendees. That number seems to be increasing as the years go by. There are many differences between the two events. One is in atmosphere. Comic-Con is said to be more business orientated. Though yes, there is heavy fan-involvement, it’s not the main focus. Comic-Con is more of a marketing opportunity for media outlets and Hollywood studios and serves as an early access area for dedicated fans who manage to score tickets before they sell out. I think the atmosphere of Dragon Con is radically different than that of Comic-Con. 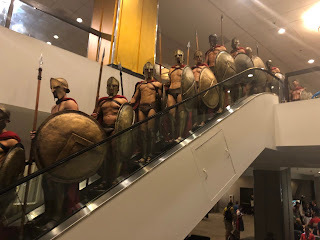 From my experience, Dragon Con is truly a fans convention. People dress up or cosplay as their favorite movie, TV, internet or video game characters in full force. The costumes, I saw, had impeccable detail that puts Halloween to shame. These dedicated and dressed fans mingle and admire costumes, attend relevant panels with guest speakers and embrace each other’s fandom for five full days. Conference rooms, ballrooms and hallways leave behind business meetings to become concert halls and Star Trek panels. Dragon Con also has nightlife that isn’t for all ages. During the day Dragon Con typically has a very relaxed atmosphere that can be considered for all ages but radically changes into an adult nightlife atmosphere that’s more for people above 18 at night. Now, despite knowing the basics, the convention itself can be like diving into the ocean for newcomers. Especially since it’s hosted across five major downtown hotels, an entire marketing district and several local restaurants and venues. You might be asking, how does one get around? How does one navigate cosplays? How many photos do I want? What panels are the best, which ones are the worst? When are the safe times to go out based on age? Where and how do you get food? Where is the best merchandise? I had all of these same questions and more as I walked into my first time attending Dragon Con. I had a blast and learned so much. 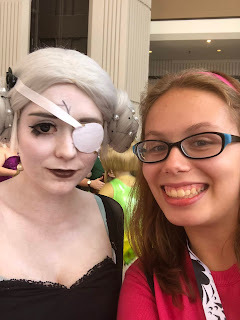 So, to help those interested in going next year, let me document my first experience at Dragon Con and what tips and tricks I learned so that you can enjoy the most out of this pop culture convention. The first official day of Dragon Con or The Con is the Thursday of Labor Day weekend. I went to school that day but left for The Con early that afternoon to get there before traffic escalated. This leads me to my first tip: get to the con early. If it’s possible, leave school early or take off work and arrive as soon as you can. Not only does traffic slowly become a hurricane once Thursday afternoon hits but it also allows you more free-time before the convention officially starts. There are several convention panels of multiple topics on Thursday. Thursday can also be a great time to relax and get to know the area as well as get individual photos with cosplayers or even the occasional celebrity. You should download the Dragon Con app to your phone or tablet. It provides endless amounts of details, schedules, rules, etc. If you live local, use a rideshare if possible. A Rideshare can be a hassle but if you live in townl, it is so much easier and less expensive than paying for four-day parking at $40 plus dollars per day! Also, my next tip, do not switch hotels during The Con. My family was not originally planning to stay Thursday night and even though I’m glad we did (because the Friday traffic horror stories sounded terrifying); it was very difficult to switch hotels later. Dragon Con is extremely crowded and this makes switching hotels a very tricky prospect, especially because most hotel rooms and Dragon Con tickets are booked sometimes a whole year in advance. So in general, I would say, decide how many days you want to stay ahead of time and then stay in a single hotel. All of the host hotels are amazing; and will treat you well. The host hotels are: Hilton Atlanta, Marriott Marquis, The Sheraton, The Westin and The Hyatt. After we settled in our first hotel of the weekend, we went to pick up our membership passes on the first floor of the Sheraton. These passes give you access to everything related to The Con and you can’t do much without them so pick them up as soon as you can. This becomes even more crucial as lines get longer. Thursday evening seemed to be a good time. After we picked up the passes, we went to our first panel in the Hyatt, titled “Thanos: A History of the Mad-Titan.” This was a very informative panel hosted by fans about the history of one of Marvel Universe’s most iconic and threatening villains. It was also pretty funny with an open discussion. The panel ended at about 9:30 pm and I was pretty tired, so we decided to settle into the hotel for the night. We also managed to score a little food from the lobby. Next tip: bring food with you! All of the food at Dragon Con is relatively cheap and available at local food courts and stands but the hotel snack bars are your only option as night falls. I would recommend keeping a large pack of bottled waters in your room for the weekend along with some goodies for late night snacking. That was the end of Day One and by far the least interesting day. After that, the convention got far more fun! The next morning, I woke up at about 7:00 a.m. and got dressed to get to an early morning panel. That panel was called “How to Write a Book in an Hour.” This panel was useful for generating ideas but overall was just okay, at least from my perspective. After that, we went to the nearby food court and got some stuff for lunch and checked into our next hotel at The Atlanta Hilton. My dad had been working the previous night but he was finally able to join us that afternoon. Once we got my dad and the rest of the family settled, we walked around the Hilton and snapped pictures with cosplayers. In the afternoon, we went to a panel hosted by one of my favorite people at The con, goth artist Aurelio Voltaire. His panel was basically a Q&A that was utterly hilarious and touching as he shared his life story. I also got to meet him and he took a selfie with me! We tried to attend to a few other panels but they were too crowded too quickly so we resolved to go back to our hotel room until about 10:30 pm when my mother and I went out to get in line for the Aurelio Voltaire concert at Midnight. The concert had a line that stretched down the block and barely fit everyone in the room. It was an electric, entertaining event. Saturday is always, always, the most crowded day of Dragon Con and even though I had things I wanted to do, the crowds made it very hard to navigate the area. We got up at about 8:00 am and got dressed for the Dragon Con Parade. It was a massive ordeal to get to the parade and when we arrived 30 minutes before the event, everything was already crowded. In many respects, it was a miracle we got a spot to see the parade! This is the point where I realized something I should’ve recognized earlier and a tip for you: find a spot to watch the parade as early as possible! The parade is televised and it is filled with marching bands, celebrities and cosplayers dresses in elaborate costumes. After a lunch break, we went to the vendors’ hall which is housed at the America’s Mart buildings. Originally we were going to try and make it to another panel but found the crowds far too taxing so we simply stayed put in the vendors’ hall and window shopped all of the fun memorabilia. The vendors’ hall made up of three buildings filled with every type of nerdy thing one could hope to imagine. Pens, t-shirts, dresses, costumes, plushies, food and even several dozens of functional swords! It’s a city of nerdy merchandise. I did score an awesome notebook which I was able to use the rest of The Con. There was also a gamer’s meet up in these buildings that we did not attend. We were so tired from the crowds and walking around all the city blocks, so we retreated to the hotel room for dinner. Day four was our last day at the convention and by far one of our busiest. My Mom and I went to an early morning panel called “Writing for Comics” and then went to another called “Finding Your Story.” These panels were very well put together and amazingly useful for writing. That afternoon, we packed up our hotel room, left our bags at the front desk and squeezed in two more panels I wanted to catch. One was an open discussion of the show Steven Universe hosted by a fan group called “The Georgia Gems.” I followed that immediately with a panel about gender roles in regards to storytelling while my little sister earned her official Agents of Shield badge in a neighboring conference room. Now that Dragon Con is very much over, I have a few more tips and tricks I have gained upon reflection. I’ll start with the things I did this year that I’ll be very likely doing next year. The first, I booked my tickets and got my cosplay and hotel bookings early. Host hotels have the potential to sell out almost eight-months to a year in advance. I learned this also goes similarly for reservations at restaurants in the area. So by all means, book everything you can in advance. Next, I would say make time to simply explore the convention center. Enjoy the atmosphere and talk to those in cosplay. A lot of people are simply there to show off their costume, walk around, take pictures and enjoy life. So sometimes walking around the hotel can be a joy all on its own, plus there are the endless photo opportunities. The final thing I did this time that I will definitely be doing again is make sure we stay safe. Big conventions like this, though amazingly fun could be sorta dangerous. My mom and dad were always with us and we were never out alone. We had a family safety meeting ahead of time to talk about crowds, talking to other fans, locating fire exits, stairways, and what to do if we get lost. Now, there were things I wish that I had done during Dragon Con. Next year, I do have some strategies. The first and most important thing is to plan a lot more thoroughly. The Dragon Con footprint is massive with lots of people, lots of panels and lots of ground to cover. Therefore, knowing what cosplays you want to wear and what you want to do is crucial. The only thing I knew I wanted to do was see were the events with Aurelio Voltaire. However, once these were over I didn’t have much else of a plan. This led me to something of a vacuum for the other days which led to some stress issues (at least for me personally) about what I wanted to do. This can apply double when you need a bathroom and don’t know where it is. So when in doubt, just remember that planning is everything and even though you can have a blast walking around and doing nothing, it is best to do a mixture of both in your schedule. My final retrospective tip, is one that is surprisingly simple but effective: don’t be afraid to be yourself. One might think this is horribly clichéd advice, especially at Dragon Con. The convention could appear to outsiders as something for only those who deeply know science fiction and fantasy. However, this simply isn’t true. Yes, those die-hard fans exist and go to Dragon Con and in many respects I’d even consider myself to be one of them. That said, I also saw a lot of beginners just starting out as well as children simply happy to be dressed up in funny costumes. I saw everything from Mario to Marvel and even Broadway plays like Hamilton. Dragon Con may have started as a science fiction convention and even though in many respects it is, it is also so much more. In conclusion, Dragon Con has become something of a yearly staple in the pop culture scene. It is a weekend where people of every creed and every fan base imaginable are present. It is one weekend where everyone feels included. The obscure cosplay idea you’ve been toying with for a while might actually gain a fair bit of traction. You don’t have to be afraid to dress up as a Muppet or wear your well-hidden Supergirl t-shirt. You don’t have to be afraid to try new things and do things you normally wouldn’t do. Nobody is going to actively judge you. So yes, Dragon Con can be overwhelming, but if you plan it well, it can be one the most fun times of your life. It was for me.